It wasn’t going to be just any picnic, oh no. 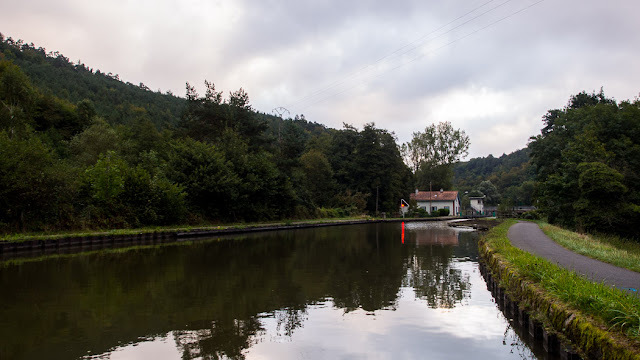 Even as we set out to cover the five kilometres and two locks to our meeting place the roast was in the oven, the potatoes on their way, the risotto being stirred. Aileen was bringing Grahame and the tarte tartin, Maggie, Jacques and the humous, (and Frida and Bertie of course). No stone had been left unturned. They arrived at the appointed time, below the third lock and piled aboard to be carried to our secret little spot in the forest just a few kilometres away. The weather may have been trying to discourage us from sitting outdoors, sending us a chilly breeze of sufficient force that it took three lengths of rope and my best sailor’s knots just to keep the table cloth in some sort of vague contact with the table. We steadfastly refused to take the hint raising the level of our chatter and laughter to a volume that we felt would ensure the elements would feel suitably defied. It did get dark surprisingly early though. Understandably by the time we’d packed and got the mob back to the lock, the waterways were closed for the day which made our decision about where we were going to stay just a little bit easier. In this patch of forest less than four kilometres from the city, when the lights went out it was very very dark, but even before then as the car bearing our friends moved not so silently away, things went suddenly quiet. Careful there... You heard of the Bete des Vosges, a mythological beast, supposed to roam the hills in your area? Bring out the silver bullets, silver crucifix and tons of garlic! Might help. Or not.